Looking for a little more than coffee on an afternoon out with friends or family? These two cafes in Newport Mall, Resorts World, have extra special choices. What They're Known For: Their delicious kopi buns and steaming tea and coffee--and now, their scrumptious (and super affordable!) rice meals, too. The Cafe: Kopiroti has always been the place to go when you're craving breakfast-y comfort food: warm kopi or choco buns fresh out of the oven, paired with hot, creamy coffee or warm tea—each bite makes its way down your throat, and then spreads the feeling of home through the rest of your body. Kopiroti shakes it up a bit this time around, still offering the same scrumptious goods...plus a little extra. 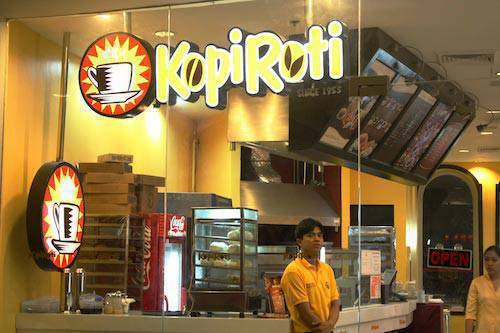 Kopiroti-slash-KR Express in Newport Mall is decorated in warm shades of yellow with functional furniture for practical dining. Who To Bring: Your barkada, if you're looking for an affordable place to have a filling merienda or if you want a quick but yummy early dinner before catching a movie at the cinema. Food Favorites: If it's a snack you're after, try their trademark Kopi buns (P45) and choco buns (P50). Breakfast in the afternoon? No trouble! Get their "Roti" French Toast (P60 will get you two pieces) or their Peanut Butter Toast (P45). Even better, you can opt for set meals. P130 will get you a Kopi Bun, two soft-boiled eggs, and kopi or tea; P115 will have you stuffed with two pieces of "Roti" French Toast and kopi or tea; and P100 will fill your belly with Peanut Butter Toast and kopi or tea. There are 10 set meals to choose from. Want something more substantial than morning food? Try KR Express' Rice Meals! P120 will get you Braised Beef Adobo, Fish Fillet Salsa Verde, Pork Spareribs, Chinese Pork Braised Belly, Chinese Pork Adobo, Chinese Beef Adobo, Five Spice Chicken, Tausi Spareribs, or Fried Porkchop. Get a plate of Chami for sharing for P190, traditional Chinese Chicken Feet for P85, four pieces of Pork Siomai for P60, or Yang Chao Rice for P150. All are totally tasty food and extra great for barkadas on a budget. Click through to the next page to check out the next cafe, UCC Cafe Terrace (with a special treat). Click through to the Gallery below to see photos of Kopiroti and UCC Cafe Terrace. What They're Known For: Delicious desserts and your daily dose of caffeine, in several yummy forms; but now, they're known for delicious food, too! The Resto: The Japanese always do things with exceptional taste—in the case of UCC, their coffee, their food, and their design. 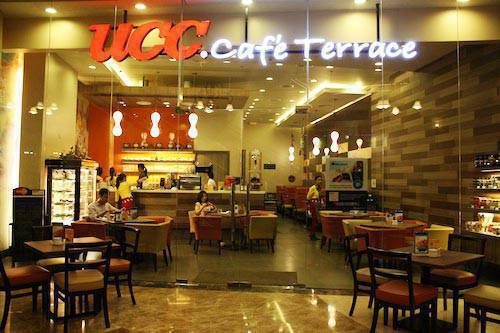 UCC Cafe Terrace is a minimalist but gorgeous cafe within the Newport Mall. The furniture is warm and wooden, and all the seats are cushy and comfortable. Sparsely decorated but completely classy, the cafe's interior is stylish and contemporary chic. Who To Bring: Your boyfriend, for a nice, relaxed night out, or your girlfriends, so you can channel your inner Carrie, Charlotte, Miranda, and Samantha. Food Favorites: If you're saving the coffee for the grand finale, try their delicious smoothies! Hawaiian Sunrise (P179) is a sweet mix of kiwi and mango, Apple Strawberry Zest (P179) is delectable, the Irish Choco Cream Cooler (P175) is sinfully good, and the Almond Roca Cooler (P155) is surprisingly refreshing. You wouldn't expect it from a cafe, but their food is fantastic! The Beef Hayashi Curry Rice (P409) is tasty and tender with just the right touch of spice. The Pita Burger (P289) is a yummy version of the traditional hamburger. The Lengua Omurice (P389) is something special: tender pieces of lengua with curry rice wrapped in a savory omelette. One of the best dishes on the menu, however, is the Adobo Flakes Spaghetti (P369), spaghetti with cream sauce topped with fried adobo flakes—a modern take on Filipino taste. Definitely a must-try! Insider's secret: Want to get free UCC coffee? Visit the owner's website, www.hubertyoung.com! Click through to the Gallery below to see photos of Kopiroti and UCC Cafe Terrace.